Two distinct and perhaps mutually exclusive understandings of utilitarianism have emerged in the ethics literature. Utilitarianism is typically regarded as an approach to determine ethicality by focusing on whether or not actions produce the greater good, but has also been conceptualized as a set of traits to which individuals might be predisposed. 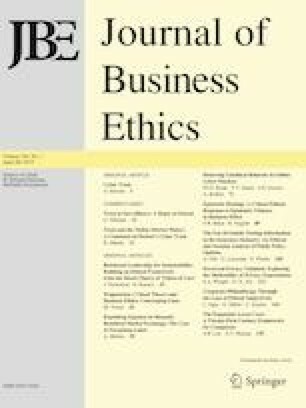 This paper is designed to clarify the meaning and implications of such utilitarian traits as “results-oriented,” “innovative,” and “a winner.” Although the Janus-headed model of ethical theory from which these traits emerged had been acknowledged by its developer as possibly misrepresenting typical views of utilitarianism, much research using these traits appears to have been conducted without clear recognition of this. If the conceptual foundation underpinning hypothesis development is disconnected from the measure used to test them, then little support for relevant predictions should emerge. A review of the literature which featured utilitarian traits generally confirmed this. This paper also explored the origins and emergence of these traits and suggested that existing evidence that these measure utilitarian ethical predispositions is not especially persuasive. Understanding what utilitarian traits do not assess is critical in order for knowledge about this potentially useful measure to advance. The authors wish to thank Diane Swanson, editor R. Edward Freeman, and four anonymous reviewers for valuable comments on earlier versions of the paper. Driver, J. (2014). The history of utilitarianism. In E.N. Zalta (Ed. ), The stanford encyclopedia of philosophy (Winter 2014 Edition). https://plato.stanford.edu/archives/win2014/entries/utilitarianism-history/. Sinnott-Armstrong, W. (2015). Consequentialism. In E.N. Zalta (Ed. ), The stanford encyclopedia of philosophy (Winter 2015 Edition). https://plato.stanford.edu/archives/win2015/entries/consequentialism/.